Hardware that needs to keep itself running in the middle of the woods has a different set of problems to solve than hardware that hangs out no further away than your back yard. Happily, [Oitzu] walks us through the whole process. In Part 1 he outlines a plan for multiple networked birdhouses, each able to report on their inhabitants but without needing a Raspberry Pi in each one. Part 2 describes the camera system. Part 3 details the communications between the units, and the overall hardware design. Part 4 covers the PCB (his first one!) and enclosures, and finally Part 5 is all about the results. The boxes have been happily running in the middle of the forest with very few problems. The Raspberry Pi (equipped with a UMTS stick – an economical mobile network data gateway) caches images from the remotes, and uploads them whenever it can obtain a mobile signal – which it can usually do fairly promptly unless there is bad weather. The birdhouses are currently empty, so there is nothing to do but wait for now. The final blog post has links to the image galleries of each birdhouse for when they become occupied. It’s hoped that Boreal Owls will make an appearance. Supplying power to hardware that lives headless in the middle of the woods is a problem, and [Oitzu] took an approach similar to this solar-powered, tweeting bird feeder: that is to say, a large solar panel and a hefty rechargeable battery. But with some of the recent projects like this battery backup and power management solution for the Raspberry Pi making progress, maybe options for easier and better control over headless hardware in the woods will grow. We had a finch nest that we planned to put a USB endoscope into, but a crow found the nest and that was the end of that. Oh well that is nature for you, and you can’t interfere otherwise you aren’t doing science any more, it was a hard lesson for my daughter to learn. Sorry to hear that. Our first testing actually ended with a hungry mammal that found some delicious bird eggs. 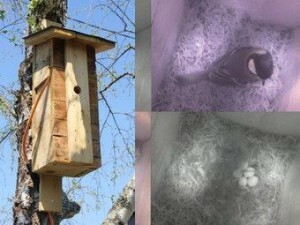 Our first test was ended by a mamal that invaded the birdhouse and robbed all the eggs. That’s sweet! Good luck this year! Keep the cats away. These homes are also the perfect bird trap, or the perfect birwatching setup.